The Fairy Queen. Florimel and the Witch. Home » The Fairy Queen. Florimel and the Witch. Such laesinesse both lewd and poore attonce him made. 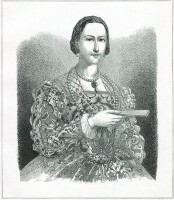 F. R. Pickersgill, Artist. G. A. Periam, Engraver. Edmund Spenser was an English poet, older contemporary and one of the models of William Shakespeare. Spenser studied 1569-1576 at Pembroke College, Cambridge. He was born in 1552 or 1553 as the son of the tailor John Spenser and his wife Elizabeth, who had come from Lincolnshire to London. Circa 1579 patronized him Robert Dudley, 1st Earl of Leicester, and introduced him to Sir Philip Sidney. In 1580 he was the secretary of Lord Grey of Wilton, who had been appointed as the representative of Queen Elizabeth I in Ireland, and moved to Dublin to. 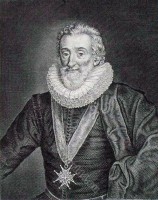 In 1589, Sir Walter Raleigh visited Spenser. 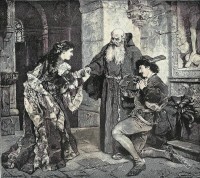 Spenser went to London accompanied by Raleigh, and met Queen Elizabeth I. Next year, 1590, he published the first three volumes of the epic poem The Faerie Queene at W. Ponsonby publishing company in London. He has added a letter to Walter Raleigh as an appendix of this work. The Faerie Queene (“the fairy queen”) is his most important contribution to English poetry. 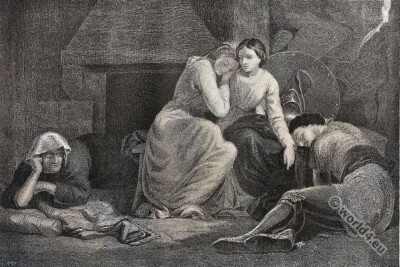 It is a poem that (successfully) the favor of Queen Elizabeth I studied a long allegory on the Christian faith, which is linked here with the Arthurian legend. Formally, it is an epic in the style of Beowulf, with verses that are comparable to those of Virgil and Homer in form. With The Faerie Queene, Spenser ushering in a new era in Anglo-Saxon literature, the English Renaissance. The poetical works of Edmund Spense. First President to the Parliament of Paris. 16th Century. 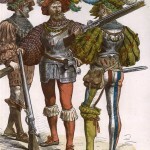 French lady fashion during the reign of Francis I. 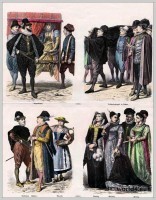 This entry was posted in 16th Century, England, Genre, Renaissance and tagged Character sketches, Renaissance fashion era on 9/25/15 by world4.